The new Jeep Compass is again recognized for being the compact SUV that drivers can not appreciate enough. These exterior features go to show how every detail of this Jeep was carefully crafted. The new Jeep Compass has unique taillamps that perfectly mold to the sweeping curves and help your ride to stand out. The LED lighting does more than look good, it will make your vehicle more visible too. Whether driving in the rain, snow, or fog, drivers are going to have little trouble being able to see your vehicle and take the appropriate action. The new Jeep Compass also has a power liftgate making life easier for drivers loading and unloading their vehicle. Even when both hands are full, with the simple push of a button, the hatch will open and you can quickly and easily load up all your stuff. 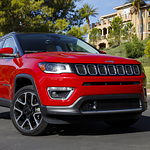 Come take the new Jeep Compass for a test drive at Leckner Chrysler Dodge Jeep Ram!